A traditional still lemonade made with freshly pressed lemon juice but using that special James White ingredient of freshly pressed apple juice rather than sugar to sweeten it. 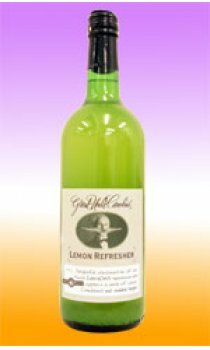 'There's nothing as refreshing as a cold glass of my very own Lemon Refresher on a long summer's day' Cornelius himself declared. He was particularly partial to a few glasses during an afternoon's croquet. Ingredients : Water, Freshly pressed Apple Juice, Freshly Pressed Lemon Juice, Apple Essence, Vitamin C.